I wear jeans a lot. At least 4 out of the 7 days of the week. 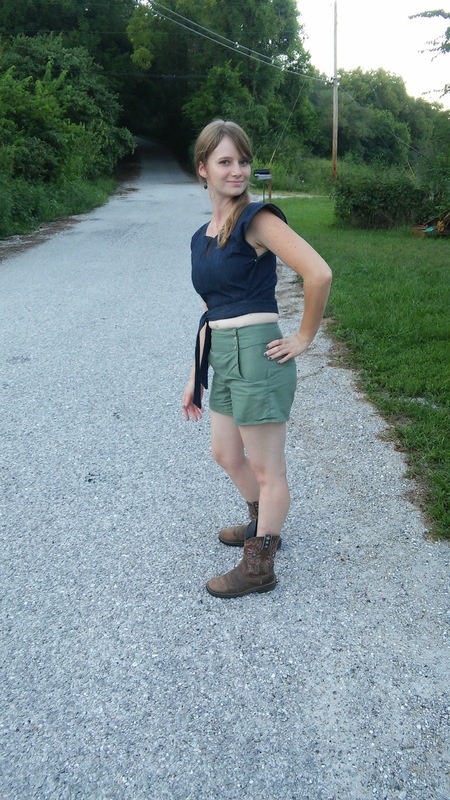 (though over the summer I got that down to 3 or even only 2 days some weeks thanks to all the shorts and skirts I made myself) Jeans are just the most practical garment for my day to day life. 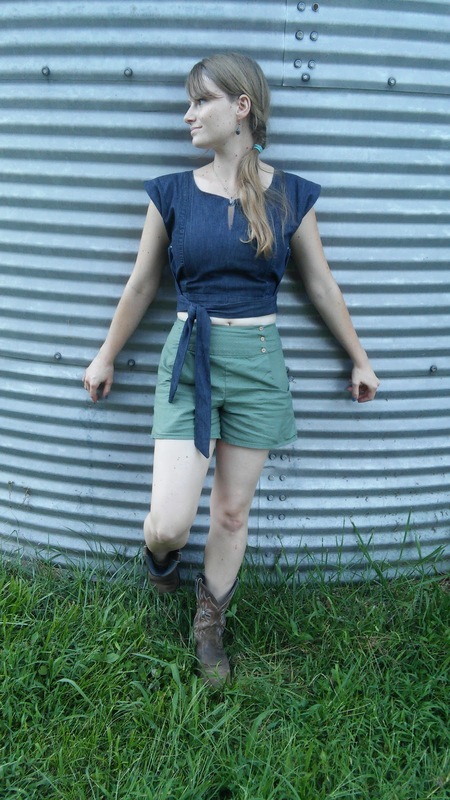 With the beginning of The Refashioner's 2016, theme Jeanius, I've been really tempted by all the amazing inspiration posts to make a shirt out of a pair of jeans, but double denim isn't really my style. So what's the point of a shirt if I won't wear it with jeans? Thus, I'd initially decided there was no possible way I would be making a shirt out of a pair of blue jeans. Then I saw this dark denim shirt one participant made, and it looked good, even great with light jeans. I was hooked. I just had to make myself a shirt out of a pair of dark jeans. 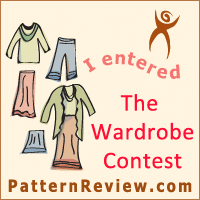 Enter: the least jean-like jeans in my stash. 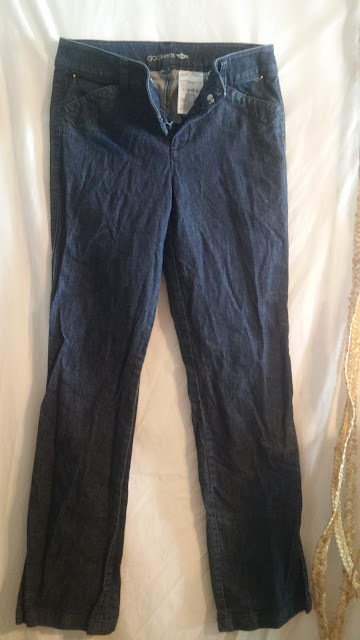 A pair of Docker's trouser-style jeans that used to be my mom's. Then she gave them to me, but I prefer my jeans to look like jeans, so I never wore them. They've just been sitting in my jeans bin for a couple years waiting to be turned into. . .something. This week I decided that something was a shirt. The denim was dark and medium-lightweight, the perfect shirt making jeans! Next, I had to figure out what type of shirt to make. I didn't want a button down, but I was afraid the denim wouldn't have enough drape for a flattering pullover shirt. After pondering this point over and over on multiple drives to and from work, the answer finally hit me! A couple weeks ago I'd come across this 50's wrap top tutorial on pinterest and decided I had to make one, eventually. Well, now was the time, why not make one out of jeans? The top is basically a large rectangle with a hole in the middle for your head. So, first I needed to make a large rectangle. 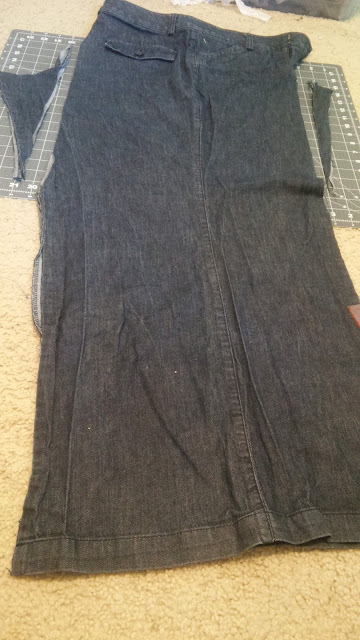 I split the jeans up the inner seam and laid them out flat. 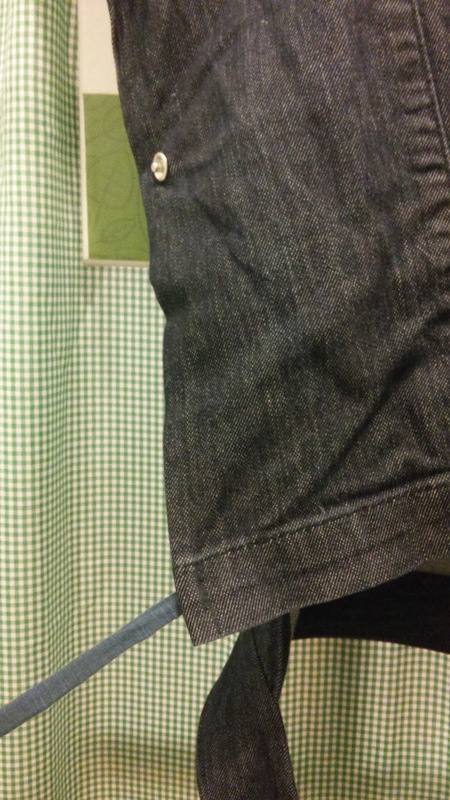 Then I trimmed off the extra fabric at the crotch and cut straight across right below the front pockets and the decorative back pocket flaps. (These jeans didn't actually have back pockets, but the front ones were real). This gave me two long rectangles. 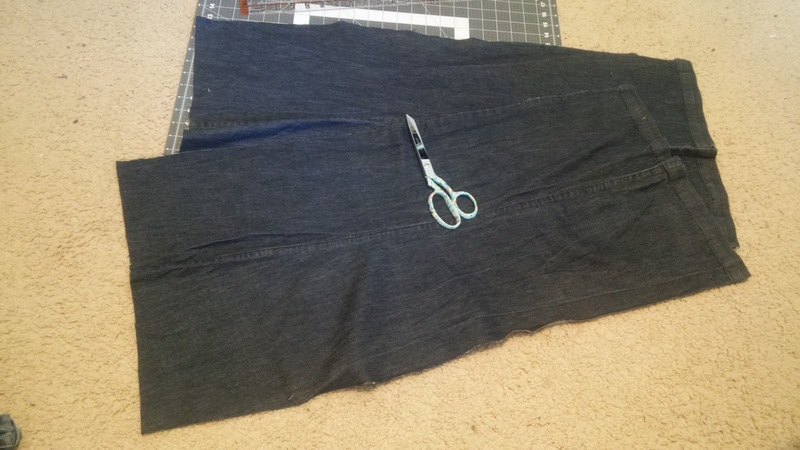 I trimmed a 2.5 inch strip of fabric off one side of each rectangle. This was saved for later. The two rectangles were then sewn together to make one wider rectangle. I cut out my neckline, serged around it, folded the serged section to the inside and stitched it down. My jeans were starting to look like the shirt I wanted them to be, but just a bit too wide. 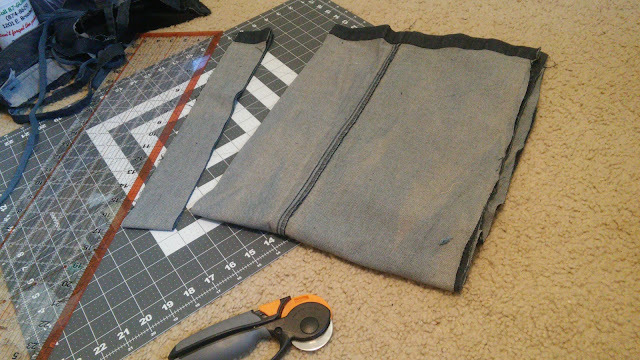 I cut another 2.5 inch strip of fabric off each side. The shirt was now the right size, so I hemmed either side then got started on the final step so that it could actually be worn; the ties. Those four 2.5 inch strips of fabric I'd trimmed off the edges of the shirt? 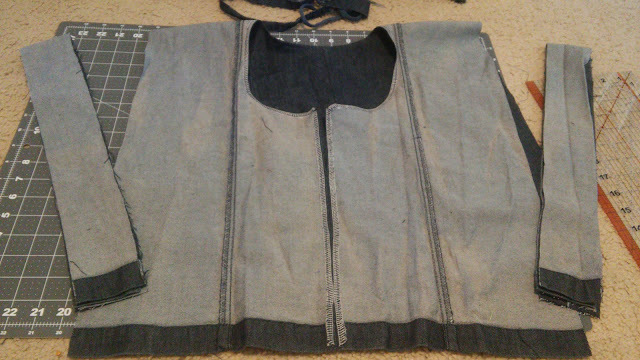 Those got turned into two longer strips and sewn to the back of the shirt to be wrapped around and tied at the front. I encased the bottom edge of the back in the waistband/ties for a professional looking finish. 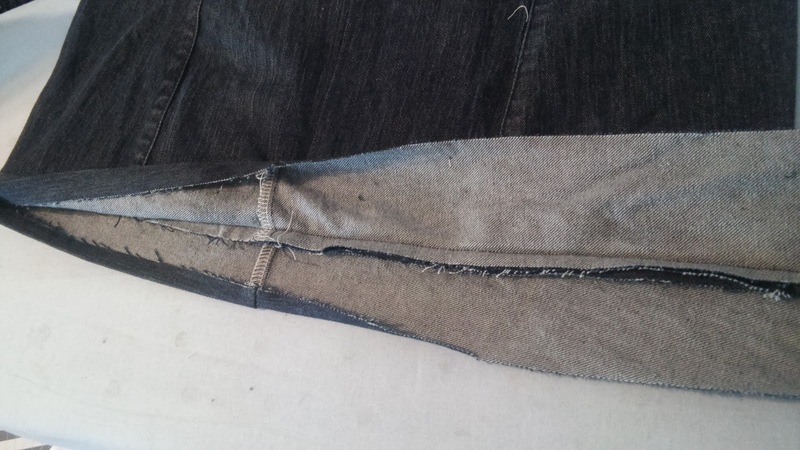 The bottom front was already finished with the original jeans hem. 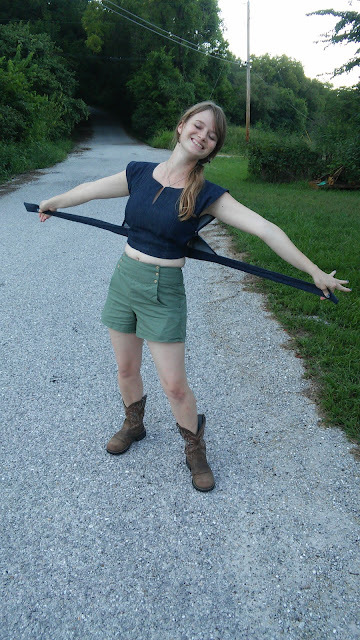 So, I sewed a fabric tie (cut off one garment or another and saved at some point in the past) to each edge, to be tied in the back, under the wide waistband. As an afterthought I added a snap on either side underneath the arm to prevent gaping. 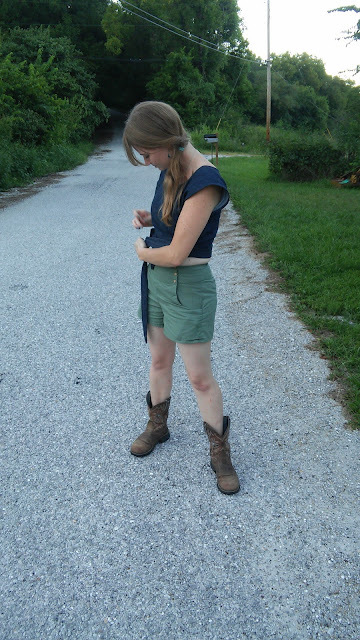 Then my shirt was done, and, due to the limited amount of fabric jeans offered, it was rather short! Honestly with the neckline not being cut too low, and the shirt not being skin tight, this shirts offers just as much, if not more, coverage as the tight tank tops I wear most of the summer. Thus, I am perfectly comfortable wearing this shirt, which is a bit surprising to me. My mom has already requested a shirt in this style for herself, with the addition of a peplum for extra coverage. 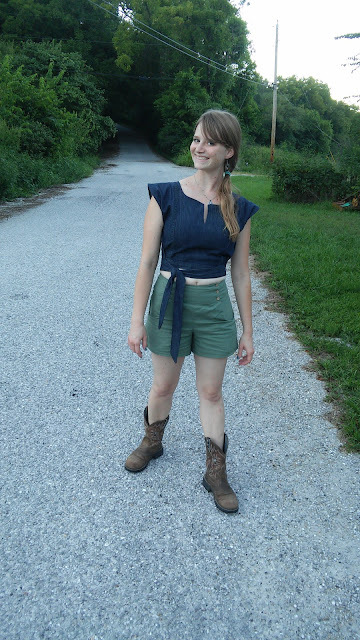 So, not only did I make myself a shirt out of jeans, it's also cropped. Two things I thought I'd never wear, but it works. The shirt goes perfectly with my button front shorts, and I have some light colored, high waisted, skinny jeans I'm planning to pair it with as well. This certainly isn't an everyday, wear it to work kind of shirt, but I imagine it will get plenty of wear on the weekends. Two entries for The Refashioners 2016 done, one planned, one more spur of the moment. Now, how many more will I have to make to conquer my stash of old jeans? Well I have at least two more projects planned, and then we'll see what's left. 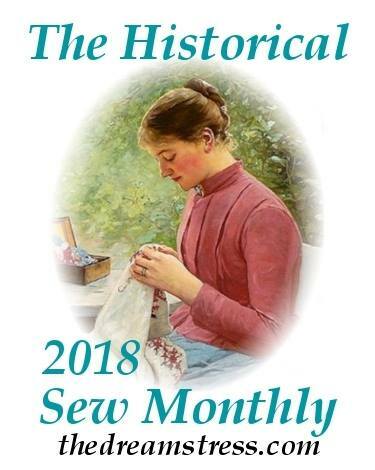 I have to give a HUGE shout out to Portia from Makery for hosting The Refashioners again this year and for picking the theme she did. This challenge is really pushing me out of my comfort zone and helping me deal with my out of control stash. Thank You! 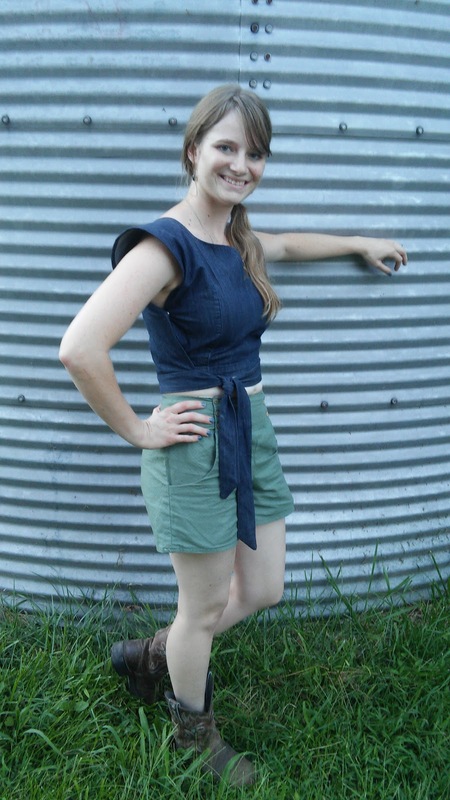 Now, if you're even considering refashioning a pair of jeans, please do! I'd love to see what you come up with! fabulous, I have seen these tops on pinterest and wondered what they were like made up, yours is gorgeous. Thanks! I love the finished product and plan on making another in a fabric with more drape at some point. I think it looks great on you, it's fab made up in denim. I love the shape that's made and I'm going to have to try this, maybe today! Thanks for sharing. Thanks, I'd love to see yours!